KTM’s hugely successful 450cc SOHC engine is already known as the lightest and most powerful on the market, but KTM’s engineers did not rest on the laurels of this epic engine. A new more compact and lighter cylinder head drops the overall height of the engine by 15 mm for better mass centralization and better handling. 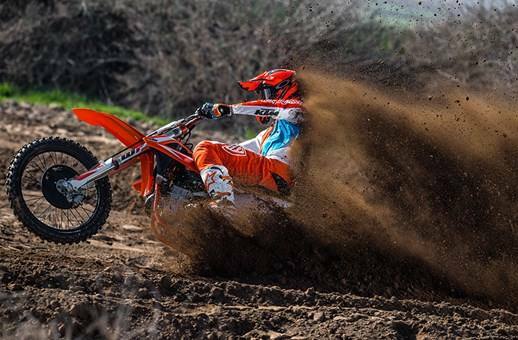 Fitted with the latest fuel injection technology and engine management, the 450 SX-F FACTORY EDITION produces unrivaled power and rideability that will shoot both pros and amateurs alike to the top of the podium. Cylinder head: At 15mm lower than the previous generation, the redesigned cylinder head puts the camshaft closer to the center of gravity of the 450 SX-F FACTORY EDITION. The cam features a new surface treatment and rides on low-friction DLC rocker arms to actuate lightweight titanium valves. A low-friction cam chain completes the highly efficient and compact valve train. Cooling: KTM’s proven cooling system routes the coolant from the cylinder head through the frame triangle, directly to aluminum radiators made by WP. New to the CFD (computational fluid dynamics) designed cooling system are redesigned radiators to compliment the thinner bodywork and a larger center tube for more consistent coolant flow with reduced pressure and turbulence. In addition, well thought-out radiator guards integrated in the front part of the shrouds provide protection in a crash. 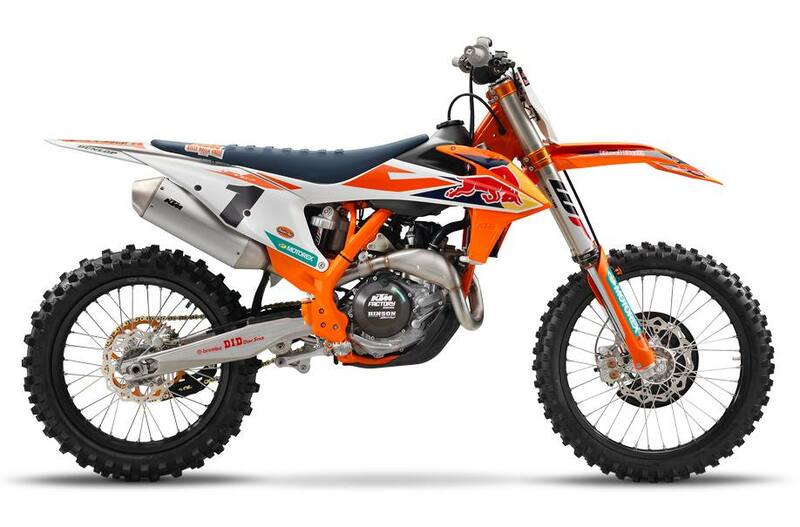 The 450 SX-F FACTORY EDITION receives an updated chassis to up its handling prowess and stability. Longitudinal stiffness of the frame has increased to improved bump absorption while the CNC-machined top triple clamp not stiffer to compliment the updated frame character. The swingarm now has 5mm more of wheelbase adjustment for more stability on high speed tracks. Updated WP Suspension settings complete a package that will ensure the 450 SX-F FACTORY EDITION is an unstoppable force in any situation. Triple clamp: The 22mm offset orange anodized CNC-machined triple clamps are now stiffer to compliment the increased longitudinal stiffness of the frame. A rubber damping system reduces vibrations and increases rider comfort. Brakes: A 260mm floating front brake rotor is matched to a Brembo master cylinder and caliper for class-leading stopping power and feel. 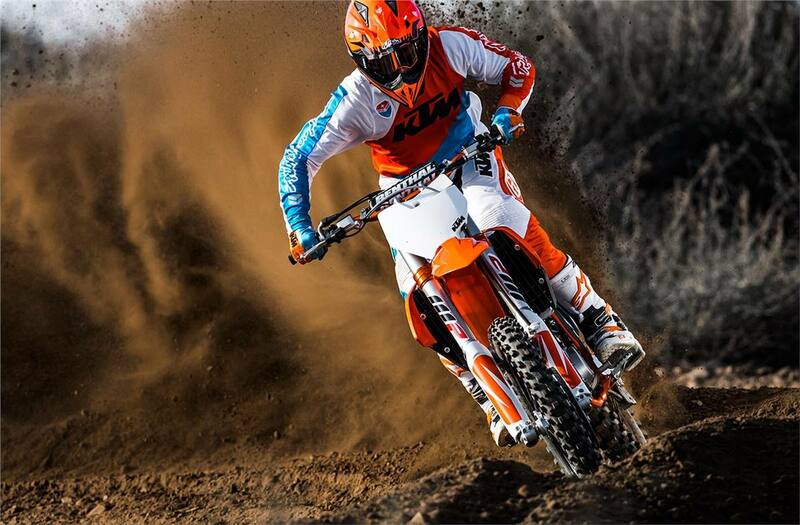 A front brake protector is fitted as standard equipment on the 450 SX-F FACTORY EDITON. Battery & wiring harness: A strong new lithium ion 2.0 Ah battery breathes life into the engine and contributes to low vehicle weight. The lightweight battery and wiring harness are centralized in a compartment above the air filter box, allowing the mechanic to remove the subframe without moving the electronics.